When current Image Comics Brand Manager Sean Edgar was Paste’s resident Comics editor, he kicked off Songs Illustrated, a series of original comics that let the industry’s finest artists loose on some of our favorite songs: Becky Cloonan on Deafheaven’s “Gifts for the Earth,” Emily Carroll on Neko Case’s “Wild Creatures,” Wes Craig on Phantogram’s “You Don’t Get Me High Anymore,” and more. The purpose was to showcase the indelible talent of these fine artists, and today Paste is proud to kick off a spiritual sequel produced in collaboration with Edgar in his new role at Image Comics. State of the Art is a video series that shows Image Comics artists at work as they discuss their series, their artistic journeys, their work process and more, all as we watch one of their characters come to life. Our initial installment features Shae Beagle, artist on the barista breakout Moonstruck. Check out the video below, and be sure to follow throughout the coming months as we feature other Image Comics favorites on State of the Art. Werewolf barista Julie and her new girlfriend go on a date to a close-up magic show, but all heck breaks loose when the magician casts a horrible spell on their new friend Chet. Now it’s up to the team of mythical pals to stop the illicit illusionist before it’s too late. 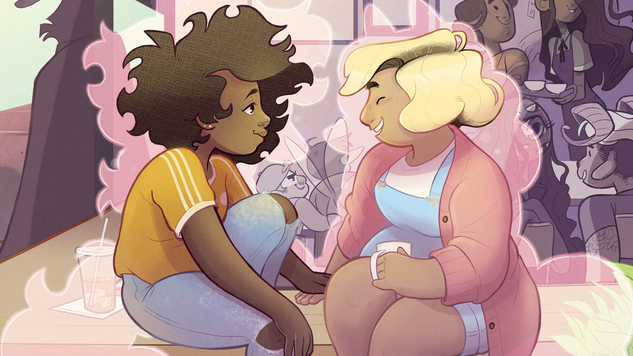 The first chapter of the brand-new, all-ages, magical, coffee-laden adventure from Lumberjanes co-creator Grace Ellis and talented newcomer Shae Beagle, Moonstruck Vol. 1: Magic to Brew is available now.